We’ll leave the legitimate question of why we’re not seeing stronger returns for another day (cleaner/clearer lake, predation, blob, etc). Today’s question instead is instead why there has been annual Tribal ceremonial & subsistence Sockeye fishing, but zero opportunity for sportfishing? Every year since 2016, coming out of North of Falcon there has been an established threshold of 350,000 fish that must be reached before a recreational fishery will be considered. On the other hand, Tribal ceremonial & subsistence fisheries have happened 10 of the 11 years, without regard for this 350,000 escapement number. So why are the tribes allowed to fish? First, as Lake Washington Sockeye are an introduced run–thus not presenting any listed/endangered species, there’s no real conservation reason why small fisheries can’t be conducted. Second, there seems to be a willingness to look the other way on Ceremonial and Subsistence fisheries. And while no one fishery has taken an overwhelming number of fish in any one year, the imbalance accumulation over a decade has been significant. Additionally, the numbers above only include the C&S fisheries themselves. That means they don’t include any ‘Test’ fisheries (230 more fish this year). And on years when the Tribes deploy gillnets targeting Coho in in the Ship Canal, and more importantly Muckleshoot Tribe nets in Lake Washington, the Sockeye staging there are harvested as bycatch. We’d have to add all those Sockeye to the ones taken in specifically directed fisheries above to reach the real total imbalance. Bottom line, the state/recreational fishermen are experiencing a dramatic imbalance on this run over the last 11 years — roughly 25,000 vs. 0. And we believe this is the year to correct the imbalance. 2017’s run appears to be headed for close to 150,000 adult returners–which is about as good as anything we’ve seen in a decade. Looking forward, the outlook for 2018 and 2019, based on outmigrating smolt counts, are likely much worse. So if one was looking for an opportunity to provide an imbalance-correcting recreational fishery anytime soon, this is the year to do it. Anyone who makes this argument will encounter a series of usual arguments, let’s take them on. The Fishery Doesn’t Open Until 350K We have informally surveyed fisheries biologists and can find zero scientific support for the current 350K number. In our view, this is an artificially introduced run, supported by a hatchery, and while that wouldn’t justify unlimited fishing, this year’s return deserves a look. 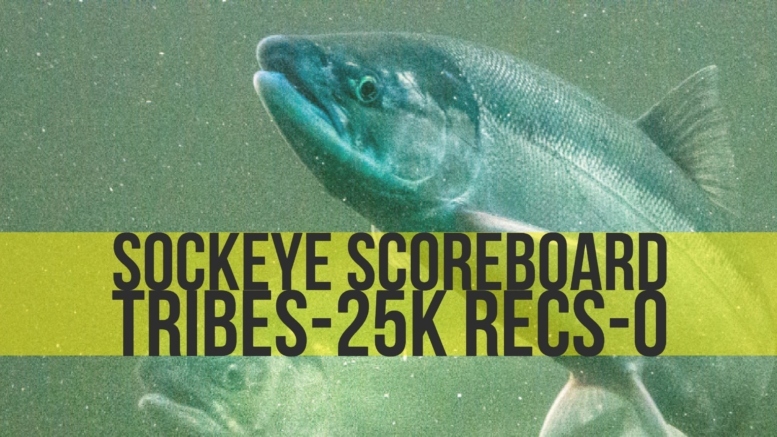 Remember, last year the Tribes opened a C&S fishery for 3000 fish, against a 50,000 returner count. A similarly impactful sports fishery this year would target 9000 fish against 150,000 returners. This will still leave the state fishers well behind on the imbalance, but it’s a start. It’s Too Difficult to Make This Adjustment Post North-of-Falcon While we understand it’s never easy to make revisions to seasons–that’s not a good enough excuse–especially when it’s happening elsewhere. In fact, about 10 days ago we highlighted a story about the Humptulips heading Mark/Selective for sportfishing this season — where the State and Tribes worked out a revision post NOF. Even more, that Humptulips revision was agreed upon to correct an imbalance in allocation that favored the state. The Tribes raised a valid concern, and the State compromised from their NOF position. Here we have the reverse — where the Tribes are being asked to compromise and suddenly it’s too difficult? Clearly the State has demonstrated a willingness to be a co-manager. Will the Tribes? Ceremonial & Subsistence Trumps Sportfishing We disagree with this assertion. We hold a great deal of respect for Ceremonial & Subsistence fishing. We view C&S fisheries on par with Sportfishing as the highest and best uses of our shared natural resources. After a decade of (near) annual C&S fisheries, it’s time for the Tribes to acknowledge the importance of Sportfishing and agree to allow the State to open this fishery. We see two paths forward… The first is that the Co-Managers get together and agree this is a great opportunity to close some of the historical gap between Tribal and State allocation on this run. We’re hopeful that these discussions progress and this develops. Failing that, we think future C&S fisheries — 2018 and beyond — should be suspended until the historical imbalance is corrected on this run. There should be no excuse for the continued harvest by one party and the exclusion of the other. 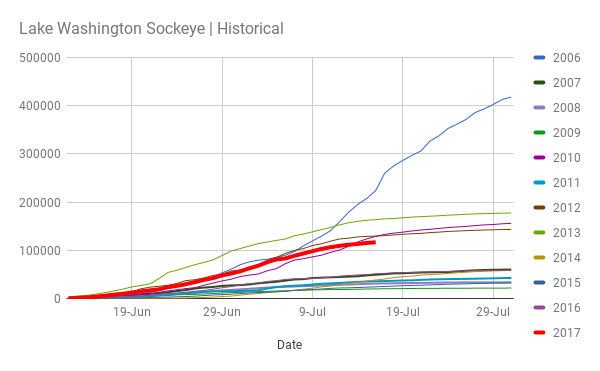 7 Comments on "LW Sockeye Imbalance | Time To Square The Ledger"
I’ll go out on a limb here with my theory. As stated in the article, the tribal fishing is being conducted under the guise of Cerimonial and Subsistance. As such they would not be subjected to any of the rules set forth by the “Bolt Decision” mandate of 50/50. Now…if those fish were caught and distributed for sale THAT would be a direct violation and subject them to more scrutiny and possible actions. However…as there is no further investigation to determine where a fish is caught AND the fact that tribes can call their catch whatever they please, we…as non-tribal members of any tribe have no further say in the matter. As a side note…perhaps we should be thankful they are not actually taking a full 50% (or better) share so there can still even be a run (it’s so small, can we even still consider it a run?). Let’s unite as sport fishers and not buy our fishing licenses next year, or tackle, or boats, fuel, repairs, upgrades, trips etc. The state doesn’t recognize anything until money is pulled away. Thank you for your untiring investigations and for helping to expose the inequities in our current “co-management” system. Once again you’ve highlighted the need for the citizen sportsmen and women to take their collective head out of the sand and see what’s really going on. We have over six hundred thousand licenses holders in this state, yet only a very small coalition of activists. The time is at hand for “Joe Fishermen” to either get involved like you guys are, or settle for scraps. The secret negotiations that are held behind closed, locked doors at the WDFW/Tribal North of Falcon meetings are the epitome of our current state of inequality in the management of our fisheries. Again, thank you for keeping the torch lite in these dark times. The Tribes need to be dragged into the 21st century – claiming ceremonial fishers is a crock – if it’s ceremonial – then they must be forced to fish in their manner of fishing back when the treaty was signed and be banned from using any method or material brought in or invented from non tribal cultures . No aluminum boats – gas powered motors – nylon nets – fishing poles . It should be noted that a return to traditional tribal fishing methods should not be looked upon as a punitive action against the tribe. Unfortunately many or most of the traditional fishing methods have been outlawed and have been illegal since the late 1800 or early 1900. Fishing wheels and fishing wiers were outlawed long ago in favor of European net fishing methods, especially gill nets. These methods and specifically gill netting has been perfected using technological advances that were pioneered in the 1950s and 1960s and continue to become more and more effective. Unfortunately they are indiscriminate and unable to be selective by species, hatchery vs native, male or female, watershed of origin etc. etc. The only selection is based on size and you know absolutely nothing about salmon if you cannot understand the significant overlap in size that exists between species. A net size that is designed for chinook may allow sockeye and a lot of both coho and chum salmon through because they are small. That same net captures the largest and when it comes to the health and shear number of ears the most productive fish by far from the overlapping coho and chum runs. A large coho carries far more eggs and with them far mor reproductive value that a smaller fish. Gill nets should be outlawed. Far more traditional and far more selective fishery should be used. Fishing wiers used in the river system would allow for live holding pens, RFID sensors could be used to know without a doubt if the salmon in question is harvestable. Harvest counts and escapement numbers could easily be uploaded automatically using sensors. In effect taking the human factors out of the equation and giving real numbers in real time. Salmon wheels could be modified with holding pens and the same principal of selective harvest could be used. The tribes can deal with allocations of harvest time for individual fishermen and bypass gates could be used during non harvest days. Why aren’t we there yet? Sending tribes into the dark ages isn’t the answer. Bringing them into the light and using technology both old or new accomplishes what everyone can agree on. I want myself and everyone who has a stake in our salmon to do what it takes to have very strong runs, each and every year. The salmon and steelhead issues will never go away until we are all able to selectively harvest the fish commercially, for ceremonial or subsistence reasons or for sport. Make no mistake the native runs will never recover while we bicker about gill net catches because they kill nearly everything that is unfortunate enough to encounter them and there is no incentive to report that fact or your catch numbers and nothing in place that makes it difficult to lie about. Identical problems have been found all over the globe from the use of gill nets. From ghost nets killing sharks and whales to sea turtles and diving birds being killed as bycatch. It’s time to fight to put rules in place that makes everyone fish selectively and the reporting not only mandatory but electronic and in real time. The questions regarding what in practice is a voluntary reporting system should have been taken care of long ago! How hard would it be to install a fish counter with a cellular connection on the fish shoot or tank entrances on boats I mean come on how many other fisheries around the globe use far more technology to control catches on sensitive stocks. This should already be resolved.